Missouri emergency operations are in full swing. Disaster response teams are working with multi-state agencies and federal authorities, all because the big one finally hit. This time, it’s only a drill. Photo courtesy Dept. of Public Safety. Click image to see more photos from the state's Emergency Operations Center. But if an earthquake hits the New Madrid Seismic Zone, it’ll be more than falling buildings, the Department of Public Safety reports. It’ll be gas leaks, flooding, explosions, contaminated drinking water and more. Public Safety spokesman Mike O’Connell puts it this way: this scenario covers a disaster three times the magnitude and devastation of Hurricane Katrina. O’Connell says aside from disaster response and recovery efforts, a big part of the exercise is bringing the right people to the right place. “One of the great things about any type of a drill is bringing people together so they can interact, figure our how best to communicate, figure out what are the potential problems, check and double check everything,” O’Connell says. 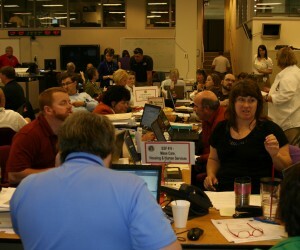 Other states participating in their own drills as part of the National Level Exercise 2011 are Kansas, Oklahoma , Tennessee, Nebraska, Illinois, Iowa, and Arkansas. Alabama and Mississippi had to drop out so they could attend to real disasters in those states. O’Connell says previously federally ordered drills have focused on terrorism. He says this is the first multi-state drill to focus on an earthquake. St. Louis and Memphis, Tennesee would be the two metro areas most impacted by an earthquake in Southeast Missouri. Authorities say more than 100 thousand refugees would likely end up in Kansas City, leading to a strain on resources there and in other parts of the state. Missouri has been split into three sections for the earthquake exercise. The western part is recovery and resource, the central part is response, and the eastern part is the affected area … the part that would suffer the biggest blow.